Screwpop® Ashtray keeps your cigar in the spotlight and your stogie in the sweet-spot for a most unique and pleasant cigar smoking experience! 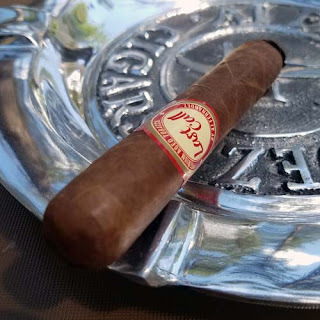 By simply orienting the cigar perpendicular to the smoker (longways facing), the Screwpop® Ashtray showcases the stogie in “presentational form”. You can now admire, enjoy and monitor your stogie between puffs: tobacco leaf, label design, burn, ash and rising smoke. Geared for a single smoker (but don’t be fooled), its compactness allows for several Screwpop® Ashtrays to fit comfortably on a table. Ideal for casual group smoking, parties and business meetings… it’s sure to impress! 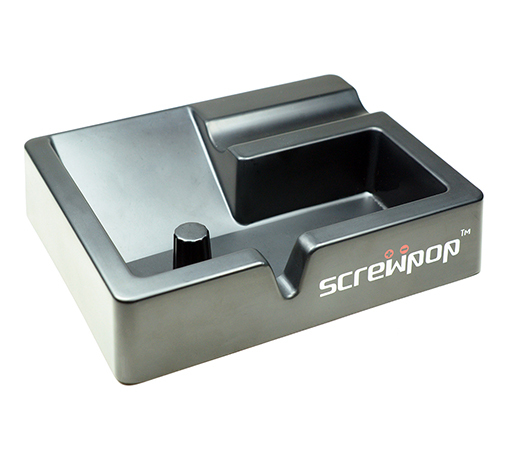 The Screwpop® Ashtray includes an ingenious “ash knocker” (for clearing the cigar-foot before relight). It also offers a well-placed tapered slot (shown front) for cigarillo enthusiasts alike. Even use the Cigar Rest as a place to put cutters, punches or lighters after smoking a gar. 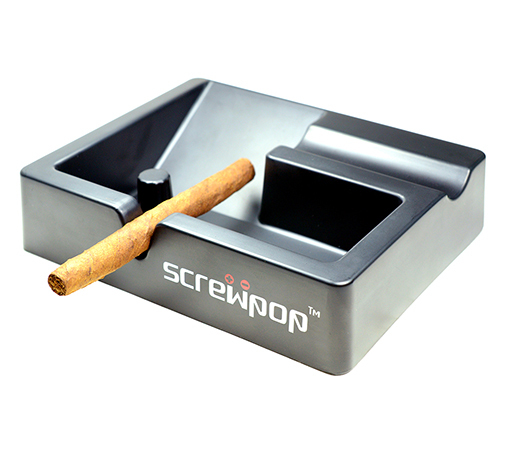 Made from ultra durable matte-finished (solid) melamine, the Screwpop® Ashtray is sure to be your new favorite cigar smoking accessory! DUIZEL, Netherlands – Royal Agio announced today that they would be releasing the Balmoral Añejo XO Gran Toro, Balmoral Añejo XO Corona and the limited edition Balmoral Añejo XO Lancero FT. The cigars will be displayed in Drew Estate’s booth (Booth #2403) at the IPCPR Convention and Tradeshow held July 24 – 28, 2016 in Las Vegas Nevada. Exactly one year after a wildy successful introduction to the United States Market, the Balmoral Añejo XO Gran Toro (6 x 52 & $10,50) and Balmoral Añejo XO Corona (5 7/8 x 42 & $8.95) join the Balmoral Añejo XO core brand family including the Rothschild Masivo (5 x 55), Torpedo Mk52 (6 ¼ x 52), and Petit Robusto FT (4 ¼ x 48). 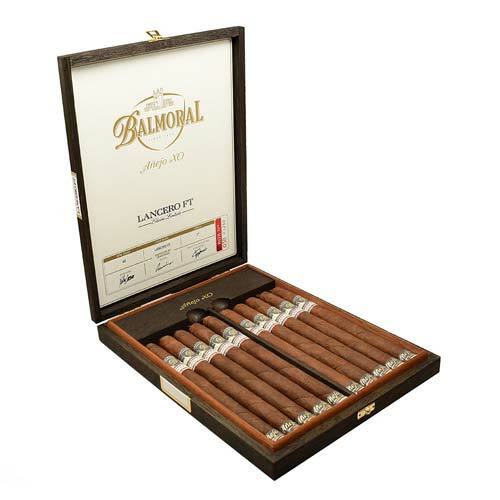 The company is extremely excited to announce the Balmoral Añejo XO Lancero FT (7 x 40 & $12.95), which will have a total production of 1,250 boxes of 10 cigars, of which 500 boxes will be allocated to the United States Market. The FT stands for the companies signature Flag Tail, and is encased in a Brazilian Arapiraca wrapper, with Dominican Olor binder, and Nicaraguan, Brazilian and Dominican fillers. When asked about the size and blend, Boris noted, “We took a great deal of feedback during the Media Summit and heard repeatedly that the participants wanted to see a limited edition like a Lancero, but also loved our Flag Tail. Royal Agio Cigars is one of the world’s leading cigar manufacturers, offering brands such as MEHARI’S, PANTER, and BALMORAL. Founded in Holland in 1904, Royal Agio Cigars is still a family business (4th generation) and has grown to become a top 5 player globally with its own production locations in Sri Lanka, Belgium, and the Dominican Republic where the company’s flagship brand Balmoral Añejo is produced. Drew Estate exclusively distributes MEHARI’S, PANTER, and BALMORAL in the United States. Founded in New York City in 1996, Drew Estate has become one of the fastest growing tobacco companies in the world. Under their mantra “The Rebirth of Cigars”TM, Drew Estate has led the “Boutique Cigar” movement by innovating new elements to the tobacco industry with their unique tobaccos and blending styles that have attracted new and traditional cigar enthusiasts. In their Gran Fabrica Drew Estate, the Nicaraguan headquarters, Drew Estate produces a variety of brands such as ACID, Herrera Estelí, Herrera Estelí Norteño, Kentucky Fired Cured, Liga Privada, MUWAT, Natural by Drew Estate, Nica Rustica, Nirvana, Pappy Van Winkle Barrel Fermented Cigars, Tabak Especial, Undercrown, and Java by Drew Estate. Santiago, Dominican Republic – Debonaire House announced today the release of the Limited Production Debonaire Cornus in Habano and Maduro blends. The cigars will be displayed in Drew Estate’s booth (Booth #2403) at the IPCPR Convention and Tradeshow held July 24-28, 2016 in Las Vegas, Nevada. Debonaire House, makers of Debonaire Cigars and Indian Motorcycle Cigars entered into a distribution agreement with Drew Estate earlier this year. The Debonaire Cornus Habano (6 x 46) features a Nicaraguan Habano wrapper, over binder from the Dominican Republic with Dominican and Nicaraguan fillers. The Debonaire Cornus Maduro (6 x 46) features a Broadleaf Maduro wrapper, over binder from the Dominican Republic with Dominican and Nicaraguan Fillers. Each blend is limited to 5,000 boxes of 10 with a per stick MSRP of $12.95 and will be produced at the De Los Reyes factory in the Dominican Republic. Debonaire Ultra Premium Cigars were intimately developed out of the passion to experience the perfect cigar at the hand of Philip S. Zanghi III, founder of Indian Tobacco® Cigar Company and Daniel Sinclair founder of Durfort Holdings® in USA. We incorporate the finest, darkest, air cured tobacco from the most superior tobacco crops of Central America and Dominican Republic. Our gourmet tobacco is blended to perfection with the highest attention to detail so that the rich history of the past can be savored in the present. Debonaire® Ultra Premium Cigars are exclusively available to reputable trusted tobacco merchants preserving the brand for many years to come. Fort Lauderdale, FL - The FDA's new ruling against the Cigar Industry will have devastating effects on cigar manufacturing, could leave more than 400,000 people unemployed in Central America, particularly single mothers that work in the fields. It could also increase the drug trade with the United States. It could result in significant job loss in the U.S.
"The companies greatest at risk for losing their business as a result of this ruling are the smaller manufacturers that have been established since 2007," said Kaizad Hansotia, the CEO of Gurkha Cigars. "It is unjust for them to lose their livelihood and for their businesses to be destroyed by a regulation that was never even intended for premium cigars." Hansotia is leading the charge to build awareness on the devastating effects of this ruling. The FDA ruling would put the same rigorous review on premium cigars that it has on cigarettes. It was initially intended for the regulation of smokeless tobacco products such as vapes that market to children and is addictive. Premium cigars were then rolled in much to the disappointment and surprise of Congress on both sides of the aisle. Premium cigars are not addictive, as they are not inhaled, celebratory and artisanal in nature. In an industry where the average price of a cigar is more than the price of a whole box of cigarettes, teens aren't rushing to cigar shops to get their hand on the latest cigar. The most damaging item in the ruling included new products. Cigar lovers eagerly wait for and enjoy new and exciting blends. This new item would require product verification and government approval prior to release. Manufactures would have to put in applications for review of all cigars. New cigars cannot be sold until the application has been approved. Existing cigars can continue to be sold for 12 months of the application being reviewed, but if in 12 months the FDA has not had time to approve it, sales must cease. The issue is that there is a notorious backlog in the FDA and, because of the artisanal nature and unique blends of cigars, it is estimated to result in more than 40,000 new applications. "If you were in business after 2007 the FDA can shut you down. How can the US government shut down a business based solely on an arbitrary start date of operation?" said Hansotia. "This ruling is punitive and goes against the principles of capitalism and what that the US represents." The FDA is not receiving any new budget or operational growth to deal with the demand so in essence you will see many cigars simply being pulled off the shelf. In addition, the ruling is incomplete, as the FDA has not addressed the cost for HPHC testing. It is expected that the cost be astronomical and will put several small manufactures out of business. The FDA has not issued any guidance on the matter. Small farms throughout Central America have enjoyed the twice a year harvest that a cash crop such as tobacco allows. Eliminating this steady and lucrative source of income could force farmers to grow other crops with similar harvests such as coca leaves and marijuana to sustain themselves versus crops with longer growth cycles and smaller paydays. "The US has been working with and subsidizing farms in Peru and Bolivia to get rid of these illegal crops and grow other things," said Hansotia. "This ruling will have an adverse effect and force countries that have not been involved in the drug trade to consider it as an option." The ambassadors of several countries in Central America have issued pleas to the White House against the rulings and the U.S. Small Business Administration went on record saying that the economic impact of the ruling has been severely underestimated. The mayors of the cities of Miami and Tampa have also sent economic impact letters to the White House. "The FDA has by and large ignored Congress, the US Small Business Administration, Ambassadors of Central America and local government in truly assessing the far reaching effects of this regulation," said Hansotia. "It is evident that the cost far outweighs any benefits it is providing specifically when discussing premium cigars." The FDA has not thoroughly thought through the ramification and the devastating effects for an industry and the country. It will not stop the smoking of cigars, which is largely celebratory in nature but what it will do is put legitimate and upstanding small manufactures out of business. The International Headquarters of Gurkha Cigars quietly carries on a century-old tradition of excellence by bringing the finest cigars to connoisseurs from its beautifully appointed facility in South Florida. Gurkha is a must have for any cigar smoker. Be advised, once you try these most alluring of all sensations and taste, you can never go back to smoking anything else. It truly is the nectar of the gods. For additional information, visit www.gurkhacigars.com. Dalton, PA - Jordan Alexander III Premium Cigar Company (JA3 Cigars) officially announces the release of their newest line, Anthracite. This new line is expected to ship in late Summer, 2016. It comes as the second full production line by Jordan Alexander III Cigars, with a current portfolio housing the JA3 Corojo which is available in four vitolas. The Anthracite line is a tribute to the coal mining history of JA3 Cigars’ home of Northeastern Pennsylvania. The vast majority of Anthracite coal is found along veins in Pennsylvania, specifically in the Scranton area. Scranton’s area has a very rich mining history with many of the breakers and production houses still intact as landmarks. 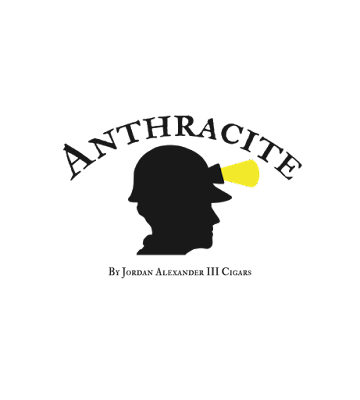 Anthracite is one of the oldest, darkest, hardest, and purest varieties of coal in the world. JA3 Cigars’ Anthracite has been designed from this template. “We’ve chosen a blend that honors the dark coal and the pure ash it leaves behind by using a rich Mexican San Andres wrapper and a blend that burns with a solid, white and grey ash,” the company said. Like the JA3 Corojo, Anthracite is manufactured by Quesada Cigars in Santiago, Dominican Republic. It is constructed using a Mexican San Andres wrapper, a Dominican binder, and Dominican Criollos & Nicaraguan filler. The Anthracite will be available in three vitolas; The Marvin (5x52), The Avondale (4.5x60), and The Bellevue (6.5x48). The names have been inspired by the coal breakers in the Northeastern Pennsylvania region. The MSRPs for the Anthracite line are: $8 Marvin (Robusto), $8.25 Bellevue (Lonsdale Grande), $8.50 Avondale (Robusto Gordo). Anthracite comes in 18-count boxes. The Anthracite is currently available to all retailers for pre-order. Pre-launch deliveries are available for Pennsylvania shops. For more information, please visit JA3Cigars.com and follow JA3 on Instagram, Facebook, and Twitter @JA3Cigars. Known throughout the world for making the finest premium cigars, Gurkha Cigars' CEO Kaizad Hansotia understands that change is paramount in the cigar business and it's critical for growth to develop new brands. Now, just in time for the 2016 International Premium Cigar & Pipe Retailers trade show, IPCPR, Gurkha has released five new blended cigars and sizes that are expected to become blockbusters. They are the Gurkha Heritage, Ghost, Cellar Reserve 21 Year, Pam American and the Jubilee. Gurkha Heritage: Adding to the original Heritage Collection, Gurkha's new Maduro will come in three flavorful sizes: a Robusto (5 x 55, $7.99), Toro (6.5 x 52, $8.99) and a new Robusto Corto, which measures 4.5 x 48. It has a Mexican San Andreas Wrapper and retails for $5. It's packaged in boxes of 24. Ghost: Gurkha's Ghost Collection is adding a pair of two new sizes in the Figurado shape to its sleek and alluring line. The Spooky is a 4 x 60 with an MSRP of $7 and the Phantom is a 5 x 58 size with a MSRP of $8. Both cigars come in a 21-count box and will be packed without the tubes. Cellar Reserve 21 Year: Adding to the majestic Cellar Reserve anthology, Gurkha is unveiling three new sizes of their 21-year Cellar Reserve. These cigars have a Connecticut shade Wrapper with 21-year-aged Dominican binder and filler. It is available in limited production. Sizes include the Solara 5 x 58 with a MSRP of $13, Hedonism 6 x 58 with a MSRP of $15 and the Kraken 6 x 60 with an MSRP of $16.50. 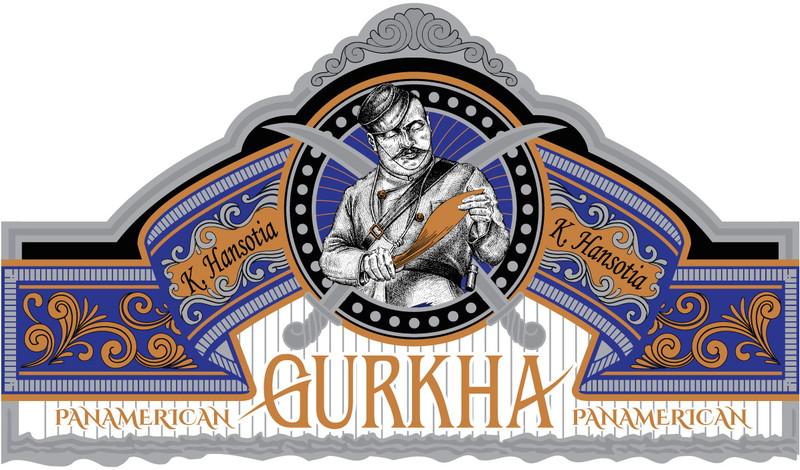 Pan American: Gurkha is unveiling its new Pan American cigar. This new line comes in one size; the XO at 6 x 60 with a Connecticut Wrapper, Nicaraguan Binder and Filler. It retails for $9.50 and is sold in boxes of 25. Jubilee: The Jubilee is a 6 x 58 Toro Vitola with an aged Ecuadorian Habano wrapper and Nicaraguan binder and filler. The Jubilee is specially packaged in a 10-count limited edition humidor. It retails for $20. Gurkha Cigars are known throughout the world as the Rolls Royce of cigars, so it's no surprise that they are the most sought-after cigars in the market. Gurkha produces eight million cigars per year that are sold in more than 58 countries worldwide. 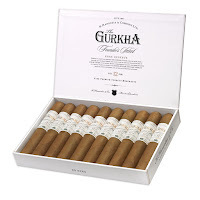 And while Gurkha is known for its exclusivity, it has an impressive array of 105 brands of flawlessly handcrafted, premium cigars created in a variety of strengths, tasting profiles, and price-points. 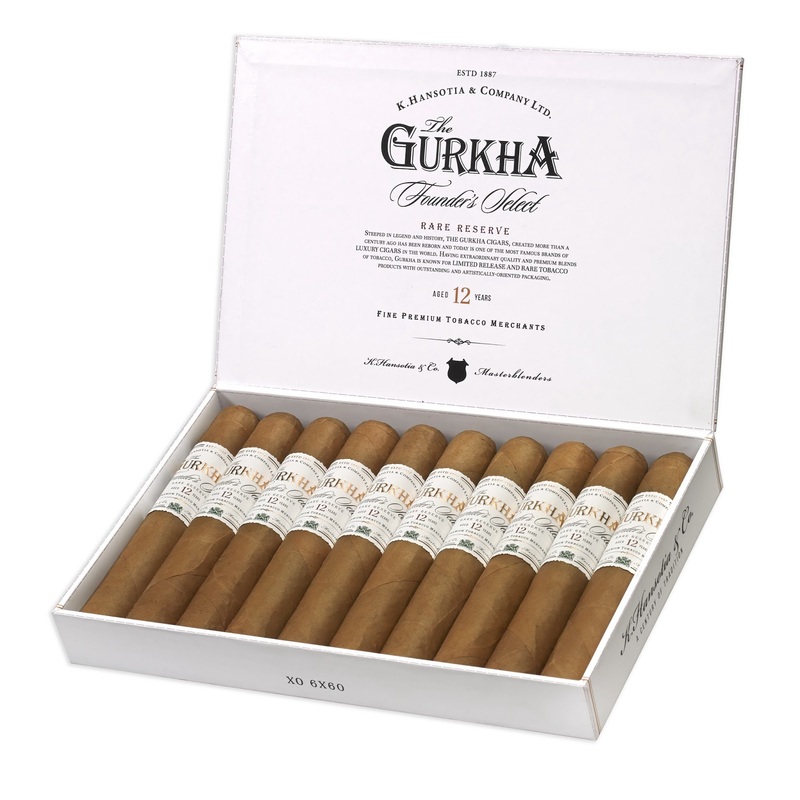 No matter what your taste, there's a Gurkha cigar that's perfect for your palate. For additional information, visit www.gurkhacigars.com. Southbury, CT – July 8, 2016 - Rick Ardito has officially joined Foundation Cigar Company as Brand Manager, for the highly anticipated July 2016 release of Nick Melillo’s exciting new brand, “The Upsetters.” Ardito brings a wealth of knowledge and valuable experience to the project backed by nearly two decades of industry experience beginning with Drew Estate in 1997, retiring in 2010 as both a Partner and Executive Vice President of Public Relations. Ardito also served as Vice President of Sales and Marketing for 7-20-4 Cigar Company from 2012-2015. Prior to the cigar industry Ardito served 8 years as a Cryptologist for the United States Marine Corps. Upon leaving the Corps Ardito began a career in comedy performing mainly from NYC to Miami Florida, residing in both cities during the 1980’s and 1990’s, moving back to his home state of CT in 1995 becoming a successful Restaurateur in New Haven. “I’ve garnered invaluable experience directing and managing sales for Drew Estate during the companies’ first ten years and look forward to integrating this expertise into The Upsetter’s brand and the brand’s distribution arrangement with Miami. My philosophy has never changed and focuses primarily upon ensuring that I’m doing my part to insert excitement and positive regard into the equation. 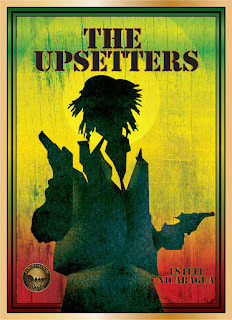 The Upsetters is a highly unique product and I’m certain it will grow legs quickly. I am committed to ensuring that, beginning with Jason Wood, and on down through the Miami sales staff, that I am supremely present and ready to serve the team. Above all I am committed to ensuring that everyone involved is having fun, because if ‘fun’ is ever present, then so will ongoing sales.” Rick Ardito. The exotic nature of the Nick’s visionary-enhanced Upsetters brand is right up my alley and my expectations for the brands complete success are very high. Foundation Cigar Company was formed by Nicholas Melillo in June of 2015 and debuted El Güegüense , The Wise Man, at the IPCPR in July of that year. Melillo has lived in Nicaragua since 2003 and has blended some of the top cigars in the industry including Liga Privada #9, T52, and Nica Rustica to name a few… Melillo formed Foundation Cigar Company to bring top quality premium cigars to connoisseurs around the world. 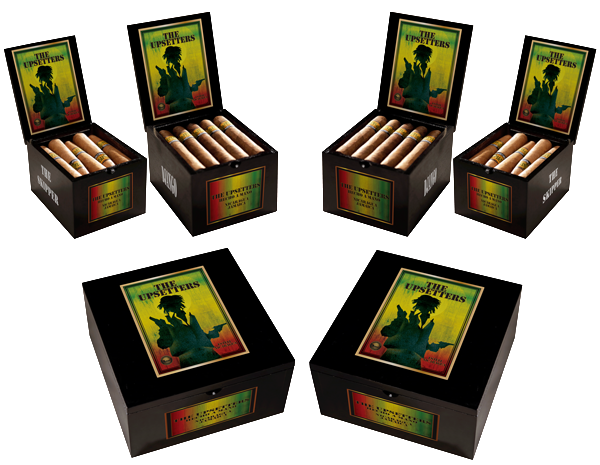 Miami Cigar Co. to Distribute the Highly Anticipated Upsetters brand by Foundation Cigar Co.
Southbury, CT July 5th, 2016 - Nicholas Melillo, owner of Foundation Cigar Company formally announces the appointment of Miami Cigar Company as the Exclusive Distributor for the long awaited UPSETTERS brand set for release just prior to the 2016 IPCPR Show in Las Vegas. Founded by Nestor and Mariana Miranda in 1989, Miami Cigar has become one of the premier distributors of premium cigars boasting a portfolio, which includes Tatiana, Don Lino and the Nestor Miranda brands. Miami Cigar & Co. also serves as exclusive United States distributor for La Aurora, S.A. and all Viva Republica brands. Foundation Cigar Company was formed by Nicholas Melillo in June of 2015 and debuted El Gueguense, The Wise Man, at the IPCPR in July of that year. Melillo has lived in Nicaragua since 2003 and has blended some of the top cigars in the industry including Liga Privada #9, T52 and Nica Rustica to name a few. Melillo formed Foundation Cigar Company to bring top quality premium cigars to connoisseurs around the world. “We are anticipating rapid interest and growth with The Upsetters brand, and I’m confident that the already in-place and highly professional Miami Sales and Distribution infrastructure will spread the brand evenly with brick-and-mortars coast to coast. Above and beyond Miami’s involvement, I am supremely excited to announce the appointment of a Brand Manager for the Upsetters next week. 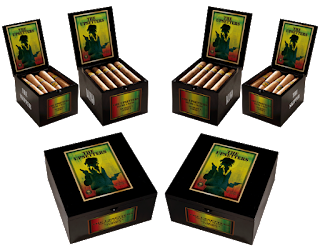 The Upsetters brand will be offered in 8 sizes, and will retail from $5-$12 per stick. The cigars will be produced in a un-disclosed factory in Esteli, Nicaragua especially for the brand. 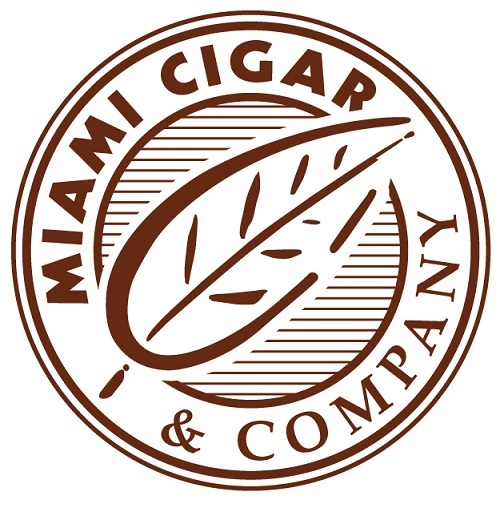 About Miami Cigar & Co. Founded by Nestor and Mariana Miranda, Miami Cigar & Co. has become one of the premier distributors of premium cigars boasting a portfolio which includes Tatiana, Don Lino and the Nestor Miranda brands. Miami Cigar &Co. also serves as the exclusive United States distributor for La Aurora, S.A and all Viva Republica brands. Cigar enthusiasts have good reason to be excited. A new boutique cigar manufacturer Baracoa Cigar Company is set to release their first line, with a full dedication to providing the highest levels of quality and service. The company has celebrated their debut, with the release of “The Voyage” a premium hand rolled cigar manufactured by La Aurora factory using some of the finest tobacco available. Many people would argue a great cigar is one of life's true pleasures. In fact, in the Americas it's a tradition that has begun even before the United States saw its first day. This makes the expectations of quality among American cigar smokers quite high and their passion for cigars close to unmatched. Stepping up to answer this call is the Maryland-based, Baracoa Cigar Company, a new boutique cigar manufacturer who recently announced their launch of their first brand, after years of research, trial and preparation. The brand celebrated their launch with the announcement that their first cigar “The Voyage”, an expertly hand crafted cigar, which is already the subject of passionate discussion, for its combination of quality and very attractive price point. 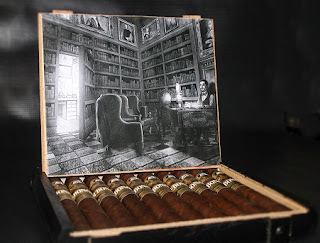 “The Voyage” will be released in a 5x50 Robusto and a 5 ½ x 54 Toro vitola, sold in boxes of 20. It features a 2011 Dominican Corojo wrapper. Ecuadorian binder, Nicaraguan and Dominican filler and is hand rolled at the La Aurora factory in the Dominican Republic. According to Vazquez, the name of “The Voyage” was inspired by the adventures and attitude of Christopher Columbus himself. This drive is off to a strong start with “The Voyage” receiving very enthusiastic early feedback. For more information, be sure to visit http://www.baracoacigarco.com.